Lets take a look at the new Fox dirt bike gear collection. First of all, let me be honest, I am really excited about the new Fox dirt bike gear collection. There is lots of new designs, colouring and the looks of the new collection is awesome! Fox has even said that only thing they didn’t change was the name. Every other detail is new and this makes me really happy to write this overview for you! NB! 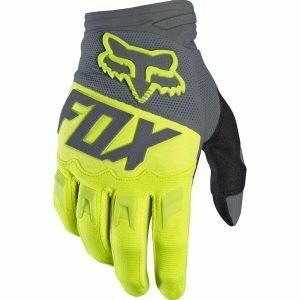 Every Fox Dirt Bike Gear detail below comes also with youth sizes and different colour options for women also. And also read my new guide about best dirt bike gear 2018. One of the biggest change in the 2017 collection is that they lost the V4 helmet. Instead of that, they improved the V3 to make this the best helmet possible. The Fox dirt bike gear collection starts with helmets. The first one is V1 which is the cheapest model by Fox. 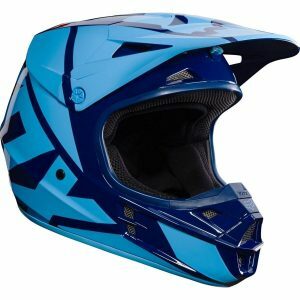 This helmet suits really well for amateur lever rider who does not want to spend much, yet wants his dirt bike helmet to be comfortable and good looking. They have lot of graphic and colour options for every taste! The Fox V1 MX helmet comes with an interior shell molded from polycarbonate. This established design provides reliable shielding against falls and debris. A plush liner, maximum airflow, and an outstanding fit are what make the helmet comfortable. For optimal comfort, the Fox V1 helmets are developed in 4 EPS and 3 shell dimensions, and are presented in 6 sizes that range from XS to XXL. By offering unique conditions per size, you get a more accurate fit. You can more locate a perfect match more easily with an extensive selection of fits and sizes. A motocross helmet with a full-face shouldn’t get too hot, or fog up on the inside while you’re wearing it. The Fox V1 helmet comes with a cutting-edge ventilation system to keep the wearer cool and focused. 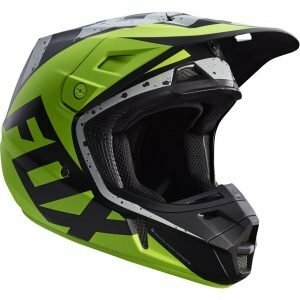 With 4 exhaust and 9 intake vents, the Fox dirt bike helmet allocates plenty of fresh air while you are riding, letting moisture and heat escape at the same time. The hybrid of a soft helmet liner and circulating air will aid in your comfort, no matter how hot it is outside. V2 is their mid level helmet and this goes really well with 360 gear! V2 also has lots of colouring options. This helmet has fiberglass shell which is lighter and makes this helmet more safe. The FOX V2 is professionally constructed on both the interior and exterior. It provides dependable protection and stunning graphic design. The helmet surpasses D.O.T. and 22.05 certifications. Durability is offered via a shell made of fiberglass, while an EPS liner with dual density provides reliable protection. The MX helmet provides sensational ventilation, which is ideal during hot days. 4 exhaust and 10 intake vents allow heat to escape, while providing fresh air simultaneously. This cooling system provides relief from the scorching heat. With 4 EPS dimensions and 3 shells, as well as 6 sizes of helmets that range from XS to 2XL, you’ll be sure to find a fit perfect for your head. A precise fit is important, as a motocross helmet shouldn’t be shifting around as you ride. The V3 would stand far and above the rest if it were graded on all of its features – premium level helmet. Created in California, the V3 motocross helmet has been relied on and worn by many Supercross champions over the last 20 years, more so than any other brand. It was built to provide optimal functionality for athletes participating in major races. 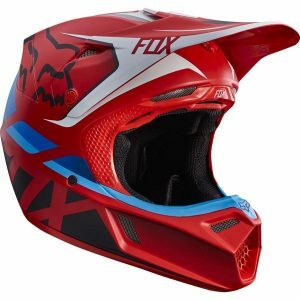 The V3 Fox motocross helmet comes is armed with the MIPS (Multi-Directional Impact Protection System). Imitating the cerebrospinal fluid, MIPS provides an additional low-friction layer between the head and the helmet. Such innovations lower the impact on the brain upon potential crashes. An EPS liner with dual density provides stronger absorption of impact by using different foam thickness in key sections. With a comfortable interior, the V3 helmet feels luxurious. 4 exhaust and 14 intake vents produce fresh air into the helmet, while allowing hot air out at the same time, producing a cooler interior. The Dri Lex® liner feels very soft upon contact with your skin, and quickly evaporates sweat, keeping moisture under control. For a perfect fit, the V3 helmet by Fox dirt bike gear is developed with 4 EPS and 3 shell dimensions. The numerous sizes help the helmet fasten tightly without squeezing your head. The V3 helmet is made for and worn by champions. This helmet weighs around 1500 grams and thats because fibreglass, kevlar, carbon fibre mix which makes this helmet absolutely light, safe and durable! Equipped with MIPS (Multi-Directional Impact Protection System). Shell constructed with composite technology. 4 EPS and 3 shell sizes for an exact fit. EPS lined with dual density protection. Dri Lex® liner for maximum comfort. 4 exhaust and 14 intake vents for maximum airflow. Surpasses DOT and ECE22.05 certifications. Option to include matching Fox dirt bike gear set. This helmet comes with a low friction MIPS layer. MIPS is a patented system developed to protect the brain. MIPS imitates the brain’s own defense system by inserting a low friction layer between the helmet and the head. A MIPS helmet can absorb impact energy from an angle. Traditional helmets are tested by having them dumped straight onto a leveled surface. MIPS is tested and developed for devastating accidents. MIPS elevates the standard for helmet protection. The biggest change with goggles is the price change. They lowered their “Main” goggle price even more and this is really affordable and good looking. 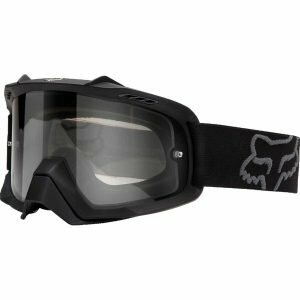 By using our existing AIR SPACE goggles and including a cutting-edge polycarbonate molded lens, Fox is pushing the envelope. This new lens innovation offers advanced optical clarity and impact resistance through its curved design. They have also included a 17mm thermoformed foam package that features embedded perspiration pathways for enhanced control of moisture. Curved anti-fog lens provides advanced optical clarity. Thermoformed face foam with triple layers. Lens are kept intact with an 8-pin retention system. 100% UV protection via Lexan lenses. See everything with the Fox Air Space goggles. By raising the volume of air by 30% within the frame, the Air Space goggles take peripheral vision, ventilation, and comfort levels to new heights. Intelligent venting ports allow cool air to circulate. Advanced perspiration absorption with 19mm triple layer face foam. Lenses remain intact with 8-pin lens retention system. 100% UV protection with Lexan® lenses. Comes with detachable rock guard. 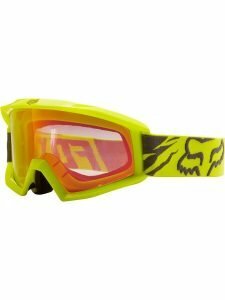 These goggles exceed entry-level motocross goggle expectations. With triple-layer foam, a broad view port, and reliable Lexan lenses, they are both effective and economical. Wide view port for superlative vision. Fleece liners with 3 layers of face foam. For over 40 years, Fox has been developing high-functioning motocross racing wear. Their passion and commitment continues to be the motivation for all that they do. The FLEXAIR jersey is the lightest jersey Fox dirt bike gear have ever developed. Made in cooperation with expert riders, such as Ryan Dungey, it is a product made with of high-caliber fabric technology and racing research. When you wear the Fox dirt bike gear jersey, you feel the mobility and comfort instantaneously. 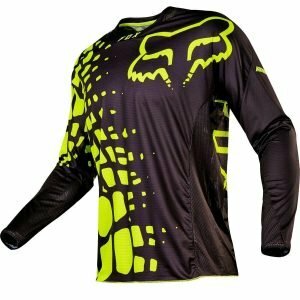 FOX Flexair jersey proprietary TRUDRI blend of fabric feels soft against the skin, and yet is still strong enough to defend your body from all that comes with aggressive racing. The elasticity of the material lets the jersey naturally move as you sit on the bike, increasing your agility. Additionally, their performance fabric is the backbone of the jersey’s moisture management. Double-knit stitching takes sweat from your skin to the exterior layer, where it quickly evaporates. It helps control your body temperature during your intense motocross races. Increased mobility with durable elasticity. Proprietary TRUDRI fabric constructed exclusively for FOX. Tremendously smooth and soft when in contact with skin. Outstanding moisture transfer maintains your dryness. Coordinating gear is an option. 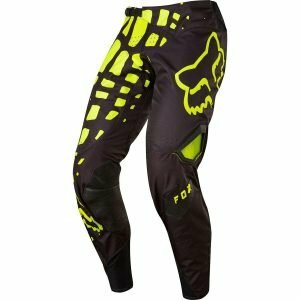 For the FLEXAIR pants, Fox goal was easy – develop the most comfortable and lightest pair of motocross pants possible. Specifications were carefully chosen to improve mobility, ventilation, and strength, without sacrificing the light weight of the pants. The FLEXAIR pants only weight 28ozs, yet they contain a 40% greater abrasion performance rating than any other MX stretch pant available. 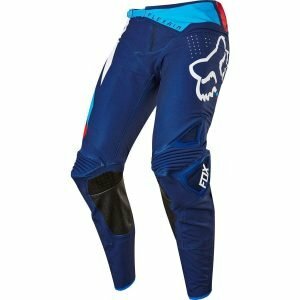 The pants are developed with their TRUMOTION 4-way elastic material, which not only evaporates sweat, but adjusts itself so you don’t feel constricted, unlike other motocross pants out there. Methodically-placed laser cut holes raise comfort levels further by offering amazing breathability. 4-way elastic body for raised mobility. Proprietary TRUMOTION material made just for FOX motocross. 40% greater abrasion durability rating, better than every other MX stretch pant available. Specified laser-cut holes keep you cool. 34” pants weigh only 28oz. Option to purchase matching Fox motocross gear. 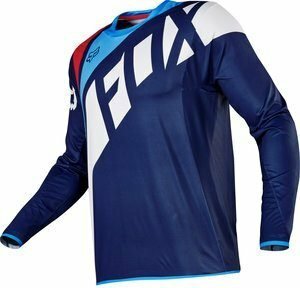 As quick as it is practicable, the Fox 360 jersey provides comfort and durability. It holds up when worn during rigorous activity, and can be seen on the bodies of many motocross champions during races. In fact, those who wear the Fox 360s are generally victorious. The jersey is embedded with a moisture-absorbing material on the main body, along with back panels made of mesh, which provide maximum breathability. This hybrid removes sweat from your skin and directs fresh air into the jersey. As a result, you remain dry, cool and comfortable, regardless of how hot the weather is. Moisture-absorbing polyester on the body. Big holes on the polyester mesh back panel for increased airflow. Fit collar very comfortable to wear. Fit cuff with minimal athletic precision. Rear developed drop tail ensures jersey remains tucked into pants. Sublimated graphics that won’t fade away. Matching gear is an option. This 360 model is the core product Fox has in the 2017 Fox dirt bike gear edition. The key changes are that the made this more comfortable with adding more airflow and made it lighter. Motocross has evolved over the years and so is Fox dirt bike gear. Once upon a time, the sport involved cone pipes that were factory-welded. In the modern era, high revving 4-stroke engines are preferred. 360 MX pants have always progressed with the times. 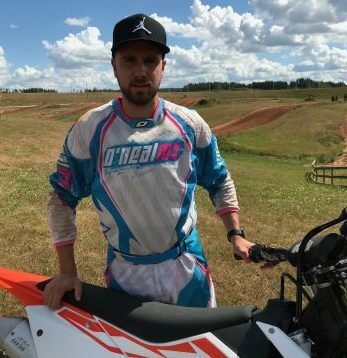 Whether you’re new to the world of motocross racing, or you’re ready for a championship race, our 360 race wear will help your performance. Not long ago, Fox dirt bike gear production technicians decided to redevelop classic 360 race wear with a new pant body. After several hours and going through numerous prototypes, Fox is ready to reveal a new line of performance race wear. 2017’s 360 pants are now available, and they have pushed the limits of innovation. The pants use TRUMOTION, a 4-way elastic material that doesn’t constrict the wearer’s range of motion, while 900D polyester shields the skin from areas susceptible to high abrasion. The placement of this intelligent material presents a noteworthy hybrid of durability and mobility. Fox RAP (Rider Attack Position) construction ensures a proper fit for the wearer, giving you the freedom to focus on the race. Lastly, laser cut vents and holes send air throughout the pants for optimal breathability. RAP (Rider Attack Position) construction for a proper fit while on the bike. 900D main body developed with polyester with zonal TruMotion panels. TPR logos and laser-perforations in key zones. Dual layer knee system with complete grain cow leather knee panels, reinforced with fabric that is resistant to abrasions. Narrow hem at cuff to remove bulk in boot area. Key areas are stitched by triple needles. Again, with the cloves, Fox has done extreme makeover. 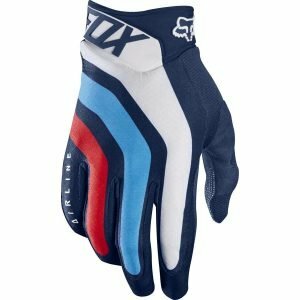 They have huge collection of gloves from entry level to advance level with many options and price levels. The 360 glove is unrivalled in comfortability, dexterity, and handlebar control. 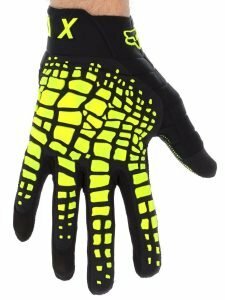 By adding top of the line materials and cutting-edge technology, the glove takes connection levels to a whole new level. Stretch Cordura® ripstop fabric maintains impressive flexibility while increasing durability. Fox dirt bike gear exclusive TRUFEEL technology provides more reliable sensitivity and accuracy by putting internal TPR knobs right at your fingertips. The final product heightens dexterity as you grab levers, tear offs, and zippers. The design also has TPR cushion support to protect the wearer from harsh impacts, as well as molded wrist closure with compression for a most comfortable fit, sans constriction. Ripstop construction with Stretch Cordura®. Individual layered Clarino® palm with carefully-placed gaps. Completely articulated, thorough insertion of TPR protection. Compression-molded thumb and wrist with loop and hook closure for a secure fit. TRUFEEL internal TPR knobs at tips of fingers. The brand new Pawtector introduces a higher standard of versatility, durability, and dependability by mixing innovative technology with advanced materials. Stretch Clarino® behind the hands provide the gloves with the right balance of flexibility and strength. The Clarino® palm is double layered, adding strength to help to circulate the air. Elastic mesh finger connections increase dexterity and further raise ventilation. The molded compression cuff offers protected closure without restriction. Dual-layered Clarino® palm with intelligently positioned gaps. Totally articulated TPR to protect knuckles. Molded cuff with loop and hook closure for comfortable fit. Experience the bike-ride in an all-new way. The Airline glove is a bare-bones motocross glove with a tremendous fit and featherweight feel. TRUFEEL innovations make this glove stand out from the rest, letting you seize control of the bike using new specification levels. Secure fit with compression cuffs. 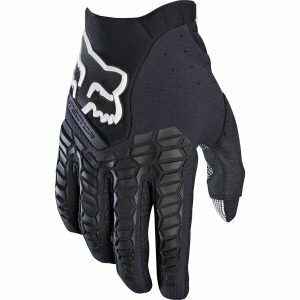 An affordable, high-performance glove, the newly revamped Dirtpaw cushions the palm and knuckles with advanced flex-point comfort. Loop and hook wrist closure. Lever grip with silicone print at fingertips. 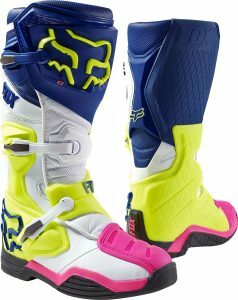 The Fox Instinct boot has been worn by the winners of the last 4 motocross and Supercross championships. From the polished profile, which provides you with a greater connection with the bike, to the unparalleled durability and grip, every aspect was taken into consideration so that the wearer could excel on the race track. Using a patent-pending buckle and hinge process, the Instinct boot offers support and comfort. Fox dirt bike gear one-of-a-kind hinge offers lateral support, and can lock-out to prevent motion prior to hyperflexion, as the buckle system adapts smoothly with the boot for movement simplicity. The Instinct boot enhances functionality by providing you with improved control of the dirt bike. A narrow medial design offers the wearer an instinctive feel of the bike, with a low ride body that allows better control and seamless shifting of the rear brake. The burn guard and outsole make use of Duratec for durability and stronger grip. This proprietary rubber was developed by Fox’s development team to provide you with the strongest advantage on the track. Check out why Instinct is the motocross go-to boot for champions like Ken Roczen and Ryan Dungey. Hinge lockout prevents movement prior to hyperextension. Exclusive Duratac Fox rubber compound offers unrivalled durability and grip on the burn guard and sole. A narrow medial design for close proximity between you and the bike. Low ride body places the rider’s boot closer and lower to the foot peg. Thin toe box for simple shifting and a narrower profile. The Comp 8 boot provides support and comfort in a conventional package. Its stealth design features rubber burn guards for better grip control. The buckles are based on technology from our Instinct boot, making way for simple off-and-on movement, and perfect functionality. Top of the line foam in the ankle area provides support where it’s most necessary, and an anti-slip heel maintains the position of your foot. Immediate step-in comfort with minimized break-in. Stealth medial development with a built-in rubber burn guard. Molded shin plate, medial, calf guard, and toe cap. Instinctive buckle system with low strap design. Ankle support with anti-slip in heel area to maintain foot placement. Added support for midsole with integrated steel shank. 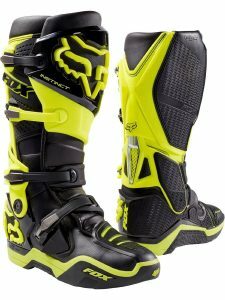 Whether you are new to the Motocross scene or are a seasoned professional, those, who ride expect quality out of the boots they wear. 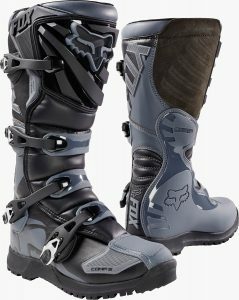 Boots should be durable enough to face the challenges of the track, be comfortable to wear for many hours in the saddle, and be protected from various dangers. The Comp 5 is developed with these challenges in mind. The Comp 5 offers support and comfort throughout every lap you do, allowing you to focus on the ride, not the gear. The alloy buckles are simple to use, and are easy to close. A reinforced metal guard and shin plate provide you with amazing coverage.